Another court martial at which an RAF ex-prisoner of war is accused of aiding the Germans while in captivity, opened at Uxbridge today. Accused is Flight-Sergeant Jack Alcock, a 32 year old air gunner. In the case of Allcock the prosecutor is Squadron Leader R W Goff (RW) barrister: president of the court, Air Commodore E I Bussel, and the Judge Advocate Squadron Leader J W Stansfield. Flight Lieutenant Cook who belongs to D Unit, RAF Station, Uxbridge, and is a London barrister is defending. 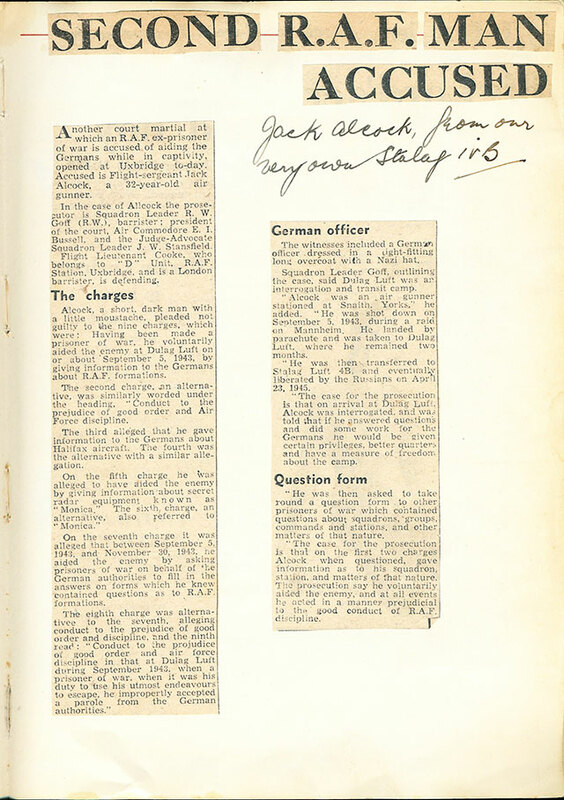 Alcock, a short dark man with a little moustache, pleaded not guilty to the nine charges, which were: Having been made a prisoner of war, he voluntarily aided the enemy at Dulag Luft on or about September 5 1943 by giving information the Germans about RAF formations. The second charge an alternative, an alternative was similarly worded under the heading, “Conduct to the prejudice of good order and Air force discipline. The third alleged that he gave information to the Germans about Halifax aircraft. The fourth was the alternative with a similar allegation. On the fifth charge, he was alleged to have aided the enemy by giving information about secret radar equipment known as “Monica”. The sixth charge, an alternative, also referred to “Monica”. 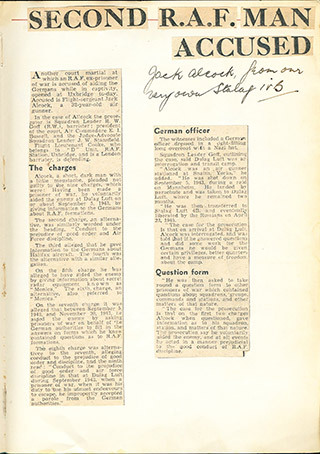 On the seventh charge it was alleged that between September 5, 1943 and November 30 1943 he aided the enemy by asking prisoners of war on behalf of the German authorities to fill in the answers on forms which he knew contained questions as to RAF formations. The eighth charge was alternative to the seventh alleging conduct to the prejudice of good order and discipline, and the ninth read: “Conduct to the prejudice of good order and air force discipline in that at Dulag Luft during September 1943, when a prisoner of war, when it was his duty to use his utmost endeavours to escape, he improperly accepted a parole from the German authorities. “He was then asked to take round a question form to other prisoners of war which contained questions about squadrons, groups, commands and stations, and other matters of that nature. The case for the prosecution is that on the first two charges Alcock when questioned, gave information as to his squadron, station and matters of that nature. The prosecution say he voluntarily aided the enemy, and at all events he acted in a manner prejudicial to the good conduct of RAF discipline.